We’d love your help. 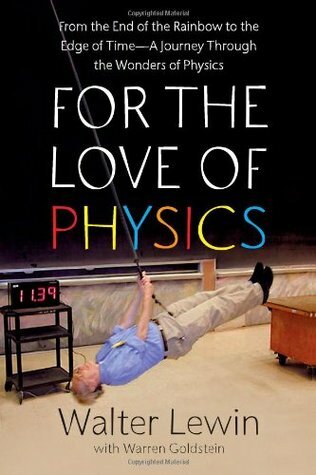 Let us know what’s wrong with this preview of For the Love of Physics by Walter Lewin. To ask other readers questions about For the Love of Physics, please sign up. isn't there any PDFs for this book 3 ? This man proves that teachers make a difference. That a good teacher can make anyone care about his topic. I loved math in school, but when I got to calculus, for some reason, I just couldn't understand it. And so I decided to skip physics altogether. However, I really wanted to read the book Einstein: His Life and Universe, because I think its author, Walter Isaacson, is a genius. It seemed like the perfect marriage of author and subject! But I have never liked science, as it was taught in scho This man proves that teachers make a difference. That a good teacher can make anyone care about his topic. I loved math in school, but when I got to calculus, for some reason, I just couldn't understand it. And so I decided to skip physics altogether. However, I really wanted to read the book Einstein: His Life and Universe, because I think its author, Walter Isaacson, is a genius. It seemed like the perfect marriage of author and subject! But I have never liked science, as it was taught in school. Too much memorization, not enough excitement. And in high school, bad teachers. Meanies! I felt like I needed some type of physics background to understand Einstein. Because of Professor Lewin, I am now fascinated by science. I never thought this could happen, but his picture on the cover of the book had me questioning my preconceived notions. The audiobook was also available at one of the local libraries, so I thought I'd take a chance. I'm so glad I did. He quite simply loves physics, and his enthusiasm and passion is contagious. Walter Isaacson, with his book Benjamin Franklin: An American Life, showed me that history can be the opposite of dull if one finds the right book. This can be that book for you if you think physics is boring. Lewin blew my mind in the first chapter, as he explained in real terms the vastness of the universe. He explores stars, the magic of a straw, rainbows (in some depth), and the physics behind musical instruments, plus black holes, X-rays, and much more. He provides examples that put the "wow" back in to science, making abstract concepts concrete, and real. I had so many light bulb moments. To really appreciate this man's gift, you must see him in the classroom. Thanks to MIT's Open Courseware, you can. Here is the link to the list of lectures for his course titled "Physics I: Classical Mechanics". পনের কেজি ভরের একটি লোহার গোলক ছুটে আসছে বিপজজনক গতিতে মুখ বরাবর। চোখ মুখ ভয়ে খিঁচ আছে। যদি এটি ঠিক আঘাত হানতে পারে তবে সকাল ফরাকচার হয়ে নিরঘাৎ মৃতযু। রকতে বেড়ে গেছে অযাডরেনালিন হরমোন যেটাকে বলে হয় rush hormone. মসতিষক পরতিটি মুহুরতে ইংগিত দিচছে সরে যাওয়ার জনয। কিনতু এরই সাথে কাজ করে যাচছে মসতিষকের pre-frontal cortex যেটা কিনা মানুষকে আলাদা করে অনযানয সতনযপায়ী পরাণী হতে। মানব মসতিষকের যুকতিবিদযা যেখান থেকে উৎসারিত হয়। সেটি বলছে, উঁহু তুমি মরবে না। পদারথবিদযায় শকতির সংরকষণশীলতা নীতি বলে একটি কথা পনের কেজি ভরের একটি লোহার গোলক ছুটে আসছে বিপজ্জনক গতিতে মুখ বরাবর। চোখ মুখ ভয়ে খিঁচ আছে। যদি এটি ঠিক আঘাত হানতে পারে তবে স্কাল ফ্রাকচার হয়ে নির্ঘাৎ মৃত্যু। রক্তে বেড়ে গেছে অ্যাড্রেনালিন হরমোন যেটাকে বলে হয় rush hormone. মস্তিষ্ক প্রতিটি মুহুর্তে ইংগিত দিচ্ছে সরে যাওয়ার জন্য। কিন্তু এরই সাথে কাজ করে যাচ্ছে মস্তিষ্কের pre-frontal cortex যেটা কিনা মানুষকে আলাদা করে অন্যান্য স্তন্যপায়ী প্রাণী হতে। মানব মস্তিষ্কের যুক্তিবিদ্যা যেখান থেকে উৎসারিত হয়। সেটি বলছে, উঁহু তুমি মরবে না। পদার্থবিদ্যায় শক্তির সংরক্ষণশীলতা নীতি বলে একটি কথা আছে। তুমি ঠিক যে উচ্চতা হতে সরল দোলককে ছেড়েছ সেটি সেই উচ্চতা হতে একটুও উপরে উঠতে পারবে না। কে জিতল? সেটা পরীক্ষায় নিজেকে গিনিপিগ বানানো এমআইটি'র প্রফেসর ওয়াল্টার লেউইন এর মুখ থেকেই শোনা যাক, "Physics works. And i am alive!" সেটা ডেমোনস্ট্র্যাশনের জন্য একটি সরল দোলক নেওয়া হল। L=5.21m. দোলনকাল সমীকরণ থেকে হিসেব করা হল, 4.58 সেকেন্ড। লেউইন বিভিন্ন কৌণিক সরণের জন্য দোলনকাল পরীক্ষা করে বের করলেন এবং প্রত্যাশিতভাবেই সবগুলোই আসল 4.58+-0.02 সেকেন্ড। এখানে একটা জিনিস মজার বিষয়, আমরা অনেকেই যেটা অ্যাভয়েড করি - তা হল পরীক্ষায় পর্যবেক্ষণের সীমাবদ্ধতা। আমাদের পরীক্ষায় নানা ধরণের সীমাবদ্ধতার কারণে মানের তারতম্য হতে পারে। ওয়াল্টার লেউইন তার প্রতিটি ডেমোনস্ট্রেশনে সেটা উল্লেখ করে থাকেন। এরপর বাকি থাকল ভরের উপর দোলনকালের অনির্ভরশীলতার প্রমাণ করা। বব (গোলকটি) পরিবর্তন করে যদিও প্রফেসর তা দেখাতে পারতেন, কিন্তু তিনি চান পদার্থবিজ্ঞানকে আনন্দের মাধ্যমের উপস্থাপন করতে। ৭০ বছরের বেশী বয়স্ক এই প্রফেসর ববের উপর ঝুলে ও শুয়ে ( কারণ, না শুলে L এর মান পরিবর্তন হয়ে যাবে!) দেখালেন যে দোলনকাল ঠিক সেটাই 4.58+-0.02 second. অসাধারণ এই পরীক্ষার ছবিটি প্রচ্ছদে দৃষ্টব্য। তারচেয়েও অসাধারণ হল, পরীক্ষাটি শেষ করার পর মুচকি হেসে মাথা নেড়ে চোখ টিপে আঙ্গুল নাড়িয়ে বলা, Told y'a, Physics always works! 40 বছরের বেশী সময় ধরে বিশ্বখ্যাত MIT উইনিভার্সিটির ফিজিক্সের প্রফেসর পদে থাকা Walter Lewin এরকম করে পদার্থবিদ্যার আপাত দৃশ্যমান খটমটে বিষয় গুলো সবার সামনেই তুলে ধরেছেন অভিনব ভাবে। তিনি দেখিয়েছেন, কিভাবে পদার্থবিজ্ঞান কি করে মানুষের চোখ খুলে দেয় এবং সেই চোখ দিয়ে নতুন করে পৃথিবীকে দেখতে হয়। তিনি বলেন, "You won't be able to resist it. It's a disease that will haunt you for the rest of your life. It's my fault, but i will not be able to cure you, and i'm not even sorry for that, not at all!" From now on, you've lost your virginity. Physics has removed your innocence of ignorance. ইশশ্, আমাদের দেশেও যদি এভাবে ফিজিক্স পড়ানো হত! Walter Lewin was a professor of physics at the Massachusetts Institute of Technology (MIT) until his retirement in 2009 and was well known for his popular lectures on physics which appeared on the MIT OpenCourseWare website - that is until MIT indefinitely suspended access to Lewin's courses on OpenCourseWare in late 2014 "after its investigation of a serious matter" (to quote the message that now appears on the OpenCourseWare website when you click on some of the links in Lewin's book). As I do Walter Lewin was a professor of physics at the Massachusetts Institute of Technology (MIT) until his retirement in 2009 and was well known for his popular lectures on physics which appeared on the MIT OpenCourseWare website - that is until MIT indefinitely suspended access to Lewin's courses on OpenCourseWare in late 2014 "after its investigation of a serious matter" (to quote the message that now appears on the OpenCourseWare website when you click on some of the links in Lewin's book). As I don't know the outcome the investigations I will restrict myself here to this specific comment from the website but those intrigued as to what this serious matter was are free to search online. The book is a strange one, both in terms of its contents and its style of writing. The first nine chapters address a few selected areas of physics, such as bodies in motion, electricity, magnetism, rainbows, conservation of energy, but leave many other areas untouched; the final six chapters focus on the author's main area of research, namely x-ray astronomy. Undoubtedly, the book is unbalanced in terms of what it covers and doesn't cover. However, this is not so much a book that attempts to explain physics, but rather a book that explains how Lewin taught physics. Thus the book provides a platform, especially in the earlier chapters, for Lewin to describe some of the bizarre demonstrations he would perform in front of students, one in particular which appeared quite dangerous although his faith in the reproducibility of physics ensured his safety. The style of writing was not to my liking. I'm not sure who he was expecting to read the book but to my mind he comes across as somewhat patronising, assuming perhaps that his readers know nothing of physics. In reality, I suspect most readers are quite clued up on the subject, and are the reading the book largely to see how Lewin approached the subject. Nevertheless, his passion and energy for both physics and education come across in abundance and it is easy to see why he had such a good reputation as a teacher. This is the great WALTER LEWIN, my best teacher ever of physics, he makes you love physics and see the world in another way forever, in a way full of wonders and appreciations. "I learned that art is not only, or even mostly, about beauty; it is about discovery, and this is where art and physics come together for me." "When I began lecturing at MIT in the 1970s, it was part of my personality t This is the great WALTER LEWIN, my best teacher ever of physics, he makes you love physics and see the world in another way forever, in a way full of wonders and appreciations. "When I began lecturing at MIT in the 1970s, it was part of my personality to put more emphasis on the beauty and the excitement rather than the details that would be lost on the students anyway." "Whenever students ask a question, I always say, “that's an excellent question.” The absolute last thing you want to do is make them feel they're stupid and you're smart." I would love to have taken one of Walter Lewin's classes. His teaching style is fun and energetic, and he seems to love to get his students involved in his experiments. The first part of the book is a series of 20 to 30 minute segments on various topics about the physics of everyday things. The topics range from how airplanes fly to the maximum depth a snorkler can handle and why to how we measure the distances of stars. The second half of the books discusses his own career in research using x-r I would love to have taken one of Walter Lewin's classes. His teaching style is fun and energetic, and he seems to love to get his students involved in his experiments. The first part of the book is a series of 20 to 30 minute segments on various topics about the physics of everyday things. The topics range from how airplanes fly to the maximum depth a snorkler can handle and why to how we measure the distances of stars. The second half of the books discusses his own career in research using x-ray telescopes. This part is not quite as fun as the first half, but still worth a read. Note that I listened to the audio version of this book, and I had to give it my full attention, or else I wasn't able to absorb everything he was saying. I thoroughly enjoyed listening and would recommend it to anyone who has a curiosity about nature and why things work the way they do. When I saw the Dutch ratings on this book (hardly 1 star) I was utterly shocked. I had heard so many great stories about Walter Lewin, appearing in a very well-known Dutch TV-show and captivating thousands of ears of interest. I, unfortunately, haven't yet had the opportunity to experience one of his lectures, but I certainly will do some research soon. I heard that this man did a magnificent job on making serious physics understandable for less-but-still-genius-human-beings like you and me (I g When I saw the Dutch ratings on this book (hardly 1 star) I was utterly shocked. I had heard so many great stories about Walter Lewin, appearing in a very well-known Dutch TV-show and captivating thousands of ears of interest. I, unfortunately, haven't yet had the opportunity to experience one of his lectures, but I certainly will do some research soon. I heard that this man did a magnificent job on making serious physics understandable for less-but-still-genius-human-beings like you and me (I get cheesy every now and then) and that's why I, as someone who loves science but doesn't have all that much of a genius mind, bought the book the moment I saw it in the bookstore (also because it was father's day and my father said this man is truly genius, literally and figuratively). One of the only reasons why I didn't rate this book five stars, is because I read the Dutch translated version and sometimes that was a bit confusing. From the moment I started reading this book I was captivated by his easy way of writing and I was able to flow right into the wonders of science and experience them myself. What I particularly loved about this book was Lewin's enthusiasm and his explicit love for science he is constantly trying to give to his readers, as a gift. Because he's so enthusiastic about science, you get enthusiastic too, automatically. An other thing that I admired was how Lewin managed to explain the simple wonders we see every day, but most of us do not pay attention anymore because we take them for granted. Lewin explains why the sky is blue, why clouds are white, why rainbows are curved and how to spot them in an efficient way, he teaches us about black holes, about gravity, about energy and much more, all the interesting parts of physics (as far as I can tell) are explained in a rather simple way. I do have to admit that I followed physics classes for five years in High School, so I can only say that I had some background knowledge on physics before reading this book, that's why I could skip some parts of it. In the end though, Lewin is starting to lose its pace and he converts to a faster way of explaining, which turns out to be quite confusing, consequently I haven't understood all of his last few chapters. The author writes that less that 20% of an airplane’s lift due to the shape of the wing where the air passing above the shaped wing speeds up relative to the air passing underneath. (Bernoulli’s principle). Reactive lift accounts for the rest (80% or greater). It is named for Newton’s third law. It occurs when air, “moving from the front of the wing to the back, is pushed downward by the wing. That’s the ‘action.’ That action must be met by an equal reaction of air pushing upward, so there is upward lift on the wing.” Controlling reaction lift is tricky, he states, especially at takeoffs and landings. On a night flight from the northeastern U.S. to Europe, sit on the left side of the airplane to see the aurora Borealis (northern lights – where the sun’s charged particles (solar wind) are directed into our atmosphere at the magnetic poles. After some supernova core collapses, neutron stars are formed as remnants, with mass 1.4 times the sun’s tightly compacted into a city size space, and that “a teaspoon of neutron matter would weigh 100 million tons on Earth.” The neutron star in the Crab Nebula rotates 30 times a second; the fastest known neutron star rotates at 716 times per second. The Earth and the Moon are a binary system. “If you draw a line from the center of the Earth to the center of the Moon, there is a point on that line where the gravitational force toward the Moon is equal but opposite to the gravitational force toward the Earth.” What’s interesting about this statement is that “relative intensity” beyond any exact balance point seems inherent to gravitational and electromagnetic forces. Lewin writes that gravity distorts the fabric of spacetime, “pushing bodies into orbit through geometry.” It’s interesting that he uses “pushing” as opposed to the pulling of gravity’s attractive force. книга дуже круто написана! тепер я постійно вишукую веселку і знаю купу різних кумедних штку. Прямо захотілося і відео подивитися більше, і про автора почитати. почитала. ну, і нащо я то зробила? This book was on Bill Gates' top book in 2011. Prof. Lewin's method of teaching should be adopted by all professors. He teaches physics by holding experiments in class, and backs them up with formulas. He teaches not to cover the details in physics, but to uncover the beauty of the world thru physics. Check out his experiments on YouTube, they are actually cool. The last quarter of the book went into too much technical details on his area of expertise: X-Ray - that was really torturous to get th This book was on Bill Gates' top book in 2011. Prof. Lewin's method of teaching should be adopted by all professors. He teaches physics by holding experiments in class, and backs them up with formulas. He teaches not to cover the details in physics, but to uncover the beauty of the world thru physics. Check out his experiments on YouTube, they are actually cool. The last quarter of the book went into too much technical details on his area of expertise: X-Ray - that was really torturous to get thru. The author was deeply involved in X-ray astronomy research in the 1970s, and his narrative of his experiences is really fascinating. A few of the earlier chapters are a bit basic in terms of the physics concepts he covers (conservation of energy, Faraday’s law, etc. ), but in the later chapters, he tells the story of how the field of X-ray astronomy grew, and in personal involvement. He talks a lot about Cyg X-1 and even mentions Tom Bolton and his discovery of the black hole at the Dunlop Observ The author was deeply involved in X-ray astronomy research in the 1970s, and his narrative of his experiences is really fascinating. A few of the earlier chapters are a bit basic in terms of the physics concepts he covers (conservation of energy, Faraday’s law, etc. ), but in the later chapters, he tells the story of how the field of X-ray astronomy grew, and in personal involvement. He talks a lot about Cyg X-1 and even mentions Tom Bolton and his discovery of the black hole at the Dunlop Observatory right here in Toronto (and Stephen Hawking’s bet!). There's also a good deal about his personal stories, like surviving the Holocaust and his enamoration with art. This book is not intended to teach physics to those who have studied physics and to those who pursue that subject professionally. To those who have forgotten their physics lessons, this will be a great recaller. It brings back all the pleasures that got lost in all the years after the college days. To those who still view the world and the life there in, in a way learned to look in their old physics classes, though not living by physics, this book will help clear any fog they collected on the way This book is not intended to teach physics to those who have studied physics and to those who pursue that subject professionally. To those who still view the world and the life there in, in a way learned to look in their old physics classes, though not living by physics, this book will help clear any fog they collected on the way. For me it was like a newly tested pair of reading glasses which brought in to focus many blurred images. For all y'all McGill kids: Rated 2/5 Ken Ragans. A fun read, but no more than a rehashing of Phys 131 and 142 with more rainbows and without any calculus (honestly, it reads like the lecture transcripts). Too soon, still traumatized by the final exam, and therefore didn't enjoy it. I could see Amanda circa 2016 adoring this book though. Un libro cuanto menos increíble, enseña la fisica de una forma tan familiar y simple que uno queda con ganas de leer más. Además de ser muy interesante nos da una pincelada por todos los campos de la física clásica y moderna. Magistral. La física no es aburrida, todo lo contrario. Un poco lento, pero no se puede pedir mas de un libro de divulgación. Recomendado al 100% para quienes empiezan en este mundillo. Walter Lewin is a professor of physics at MIT, where he teaches several of the introductory physics courses. These courses, which are available on the web at http://ocw.mit.edu/index.htm, are apparently very popular. I can't vouch for them, as I haven't looked at any of them yet. I can say that the book is a nice blend of popular science and memoir. The book was written with a co-author, Warren Goldstein, who is a professor of history at the University of Hartford. The book begins by explaining how Lewin, who was born in the Netherlands a few years before the beginning of the Second World War, came to work at MIT. His boyhood was marred by the German invasion of the Netherlands and the subsequent murder of several of Lewin's Jewish relatives (on his father's side) by the Nazi's and the temporary disappearance of his father into hiding. After graduate school in the Netherlands, his expertise with regard to measurements of gamma rays from radioactive materials got him an invitation to work at MIT where a group investiating astronomical sources of X-rays thought that his skills would be useful in this new arena. In this early part of the book the authors show their skill at blending both an explanation of physics (what is radioactivity? what are gamma rays) with biographical material in way that enhances both, rather than leading to jarring transitions. The next several chapters then focus more on physics topcs physics topics, such as the laws of motion, gravity, electricity, magnetism, with some relativity and quantum mechanics discussed as needed. The topics are covered mainly at a qualitative level, with few equations. I think that readers who are unfamilar with these topics would gain a good start on a qualitative understanding of these topics. The discussions of the classroom demonstrations that Lewin uses at MIT helps to make the concepts more easily understood. There are frequent web links given so readers can look up examples or demonstrations of phenomena relevant to the topic at hand. There is also a short color photo insert, devoted mainly to either rainbows, one of his favorite topics, or to his research interest in X-rays produced by astronomical objects. In the later chapters the book more resembles a memoir, as the co-authors describe Lewin's efforts to observe astronomical sources of X-rays, a goal made difficult by the generally fortunate circumstance that the earth's atmosphere absorbs most of them before they get to the surface. One way of getting a detector high enough in the atmosphere to detect X-rays is to attach it to a balloon, and Lewin did that several times in his career, a task made more difficult that the best launch site was in Australia. The co-authors do a good job emphasizing the necessity of money in experimental science, explaining why scientists spend much of their time writing grant proposals to pay for the equipment and travel, not to mention salaries for graduate students and postdoctoral associates. We then move on to discussing the interpretation of the results of X-ray observations, a subject which nicely makes use of topics discussed earlier and introduces new subjects, such as black holes and neutron stars. The latter turn out to be the main X-ray sources in the sky. The book ends with Lewin's thoughts on how both great science and great art (he is an art collector and has collaborated with artists in their work) both involve the creation of new and informative ways of interpreting the world. A lovely perspective of looking at the daily world. Walter Lewin simply spoke my mind. My ideology of teaching: Teach not what to think, but how to think. Walter Lewin is al meer dan veertig jaar docent aan het prestigieuze Massachusetts Institute of Technology (MIT). Hij is bij het brede publiek met name bekend geworden door zijn unieke college’s, die op Youtube vele kijkers trekken. Binnen Nederland is hij met name bekend door zijn optredens in De Wereld Draait Door. In zijn boek “Gek Op Natuurkunde” wil hij zijn lezer een weg wijzen naar de opmerkelijke rol die de natuurkunde in ons alledaagse leven speelt. Dit combineert hij met persoonlijke ve Walter Lewin is al meer dan veertig jaar docent aan het prestigieuze Massachusetts Institute of Technology (MIT). Hij is bij het brede publiek met name bekend geworden door zijn unieke college’s, die op Youtube vele kijkers trekken. Binnen Nederland is hij met name bekend door zijn optredens in De Wereld Draait Door. In zijn boek “Gek Op Natuurkunde” wil hij zijn lezer een weg wijzen naar de opmerkelijke rol die de natuurkunde in ons alledaagse leven speelt. Dit combineert hij met persoonlijke verhalen en belevenissen, waarbij hij vertelt over zijn jeugd en zijn carrière die hem tot docent aan het MIT heeft gebracht. Om dit doel te bereiken, put Walter uit zijn talloze natuurkundige proeven, die zijn college’s op Youtube zo’n kijkcijfer hit maakten. Zo liet hij in zijn collegezaal een sloopkogel op zich af slingeren en zet hij zich onder stroom met meer dan drieduizend volt. In this book, Dr. Lewin deciphers many confusing aspects of natural phenomenon which surround us. The mysteries of rainbows and sound, electricity and magnetism, etc., are brought within our grasp of understanding after listening to Lewin's discussions. He uses layman's terms, for the most part, and gives simple yet practical examples to make his point. He seems genuinely interested in opening a new sense of understanding of the many seemingly complex things which surround us. However, I suspect In this book, Dr. Lewin deciphers many confusing aspects of natural phenomenon which surround us. The mysteries of rainbows and sound, electricity and magnetism, etc., are brought within our grasp of understanding after listening to Lewin's discussions. He uses layman's terms, for the most part, and gives simple yet practical examples to make his point. He seems genuinely interested in opening a new sense of understanding of the many seemingly complex things which surround us. However, I suspect Dr. Lewin started with the simpler examples, which many people will have a familiarity with and an intuitive sense about, and then gradually introduced topics which for me, where more difficult to grasp. His latter topics dealing with the stars and supernovas, pulsars, neutron starts, stellar x-ray sources, and less familiar units of measure took a toll on my ability to absorb. In those areas, I strongly suspect that the audio book version, which I listened to, should have been replaced by the bound book to allow a more personal pace, and to allow examination of some diagrams or drawings. Nonetheless, Dr. Lewin succeeded in most areas to demonstrate an ability to take seemingly complex phenomenon, and explain them in everyman's terms, bringing a much improved sense of understanding to us all. With fewer and fewer Americans studying science, this book can provide useful insights into better understanding the world we live in. You have to understand before reading this, that Lewin has a genuine love of both physics and education. His love is shown plainly in the pages, and while he leaves much to doubt, it's clear the reader should explore to learn more. There is an abundant amount of resources out there for the pop-physicist to read, but most books gloss over the smaller things that are deemed "uninteresting" and go for really big physics stuff. Lewin's book, on the other hand does something incredible. Lewin takes t You have to understand before reading this, that Lewin has a genuine love of both physics and education. His love is shown plainly in the pages, and while he leaves much to doubt, it's clear the reader should explore to learn more. There is an abundant amount of resources out there for the pop-physicist to read, but most books gloss over the smaller things that are deemed "uninteresting" and go for really big physics stuff. Lewin's book, on the other hand does something incredible. Lewin takes the ordinary and makes you realize how extraordinary it really is. His take on rainbows will have you both laughing and looking around like a mad man whenever one is in the sky. Your friends will mock you for taking their polarized glasses and showing them how it disappears. But you will do it anyway, because Lewin showed you just how amazing it is! The professor, takes the most subtle of physics and turns it into something much better he turns it into something you look for on a daily level. This book could not have come from a mind with a lesser understanding of our world. Being a fan of Dr. Lewin, I picked up this one to clear my head of all the literary stuff that I've been reading. And turned out, it was quite a delightful read. While it wouldn't be fair to criticize the book on terms of prose, so if you're picking this book up, you better be interested in science! While most of the concepts revolved around basic physics, and could be boring to a science major, but the real beauty is the way Walter explains them in the most basic sense. I particularly liked his Being a fan of Dr. Lewin, I picked up this one to clear my head of all the literary stuff that I've been reading. And turned out, it was quite a delightful read. Lewin's personal narrative is likely to grab most readers right away. His life, from a childhood spent hiding from Nazis to a grown man who became a world renowned physicist, is inspiring to say the least. Lewin's love of physics oozes out of him on every page, in every lecture, and seemingly in his every day life. It is easy to see why his lectures are so popular. In this book, Lewin brought key ideas from his lecture series to the reader. After relating basic concepts of physics, Lewin detaile Lewin's personal narrative is likely to grab most readers right away. His life, from a childhood spent hiding from Nazis to a grown man who became a world renowned physicist, is inspiring to say the least. Lewin's love of physics oozes out of him on every page, in every lecture, and seemingly in his every day life. It is easy to see why his lectures are so popular. Reading this book is almost like being at one of Prof. Lewin's lectures! (For those who haven't had the opportunity, he provides links to some of them on MIT's OpenCourseWare site.) The only difference between this and the actual lectures is that he requires less math background on the reader's part than is expected from MIT freshmen- there's very little in the way of math or equations. If you're even a little interested in physics, check it out! ONe of the best science books I've read in a while. The author transmits his love of science and the wonders that we can discover through physics. He has lectures online and I need to watch them. It takes me back to my undergraduate days, when everything was new and exciting. The book just oozes with the joy of discovery that is the mark of a true scientist. In Walter Lewin, I have discovered a physics teacher that I did not have the fortune of experiencing live. I loved every bit of the book. Physics is the story of the forces that created our world, that sustain it and will one day destroy it and Walter Lewin breathes life into this story. Every chapter is a gem and this book is a masterpiece. Walter Lewin predicted that it would change the way I look at the world after I finish the book. Well, he is indeed true. I liked the book so much that even after I lost my first book on train (Did this statement contradict what I just said?) I ordered another copy and finished it. Walter H. G. Lewin, Ph.D. is a Dutch astrophysicist and professor emeritus of physics at the Massachusetts Institute of Technology. Born in the Hague Netherlands, professor Lewin achieved his PhD in nuclear physics in 1965 at the Delft University of Technology and came to MIT in 1966. Lewin's major contributions in astrophysics include the discovery of the first slowly rotating neutron star through Walter H. G. Lewin, Ph.D. is a Dutch astrophysicist and professor emeritus of physics at the Massachusetts Institute of Technology. Born in the Hague Netherlands, professor Lewin achieved his PhD in nuclear physics in 1965 at the Delft University of Technology and came to MIT in 1966.